To move a new object, you first have to select it either in the treeview panel or the object list panel in the LEX main window. If you are in the object list, you also could select several objects and move them all together to another directory. You can use now the menu option Edit - Move Object to open the Choose Destination Container dialog. Or you just use the Move Container / Move Object option from the context menu (right mouse click in the treeview or object list). There may be situations where the options and buttons for moving objects may be disabled. This might be if the LEX ReadOnly Mode is active, or when the application focus lays on the attribute list. Moving objects relies on an basic LDAP protocol method which is called 'Modify DN', because the storage place in the directory is contained in the object's distinguished name. So if we want to move object from one container to another, we actually change the distinguished names of these objects. The Lightweight Directory Access Protocol LDAP is specified in RFC 4511. A good description of the LDAP protocol can also be found at the LDAP description page at the SelfADSI LDAP Scripting tutorial. 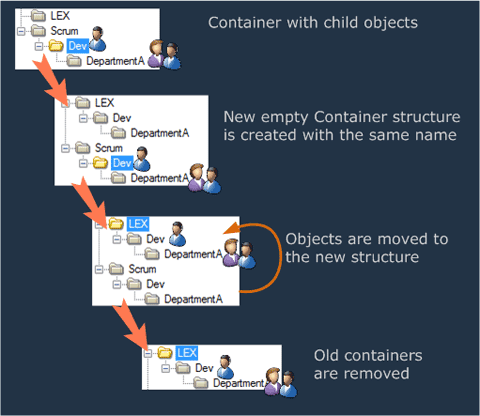 There is a general problem when objects are to be moved: If the DN of an moved object was stored in an attribute of another directory object - what happens with this attribute after the move operation?